When searching for a new apartment, seasoned renters quickly learn the signs. If an apartment looks too good to be true, chances are it’s a bait and switch. If the photos look sketchy — wide-angle images (i.e., small apartment), blurry (i.e., careless landlord) — chances are it’s going to be sketchy in real life. If it’s a railroad, you know to avoid renting with a roommate. If it advertises a galley kitchen, you know you won’t be cooking much. If it says it’s a walk-up, you better hope it’s not on the sixth floor. But what if it advertises “net effective rent?” It means you will be paying something different than advertised, so you’d better be sure you know what this term means. Here’s an explainer. What is Net Effective Rent All About? If TLDR is your MO when sizing up rental listings, you should keep your eyes peeled for the term “net effective rent.” Often, it’s tacked on at the very bottom of listing descriptions and should not be overlooked. In your travels on Naked Apartments, you might find references to “net effective rent” coupled with advertisements for a “13-month lease” and “1-month free rent.” Free rent sounds great, right? Not so fast. That’s because the rent advertised on the listing description is not what you actually pay each month. Instead of lasting the typical 12-month period, leases on apartments advertising net-effective rents will last 13 months and offer 1-month free. Net effective rent is a form of rental concession. It’s an incentive brokers and landlords use to make a listing appear more appealing to renters. Other types of rental concessions can include things like free access to building amenities or a waived broker’s fee, but one-month of free rent is the most common. After you cash in on that first free month of rent, however, you will be paying more in rent for the remaining 12 months of the lease than what was originally advertised on the listing. How Do You Know If the Apartment is Advertising a Net Effective Rent? In the listing above, the net effective rent is $1,994 based on a 13-month lease, giving tenants one month free. If you sign the lease, you agree to pay $1,994 (the net effective rent) over the course of 13 months. In mathematical terms, that’s $1,994 x 13. That yields a gross rent $25,922 over the course of 13 months. After you pass the first month of free rent, however, a new and higher market rate rent of $2,160 kicks in. 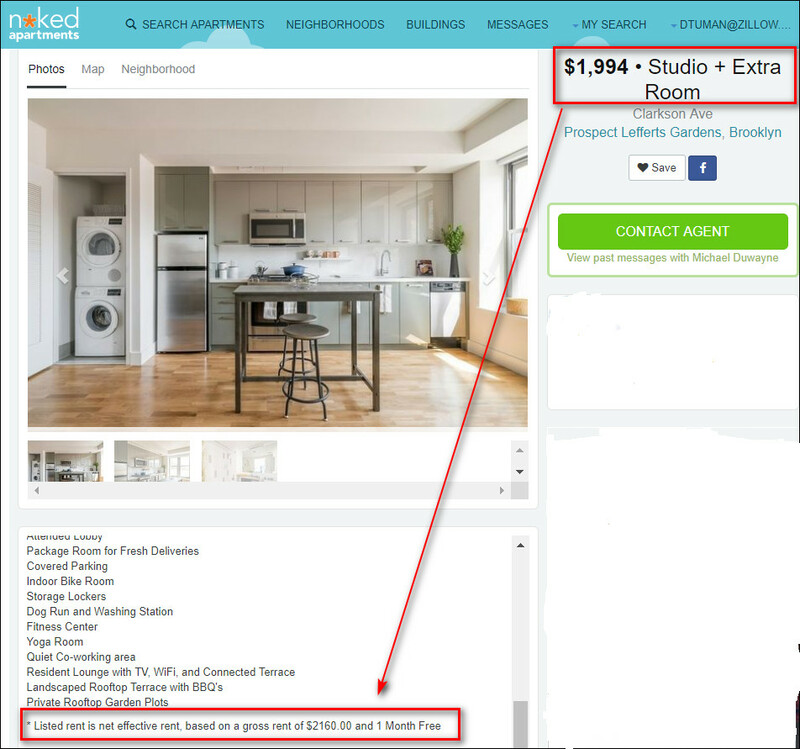 Essentially, the landlord is using the net effective rent to advertise the apartment at a lower price, but actually charge a higher monthly rent for a 12-month term after the month free. Check out the breakdown of the math below. Net effective rent rate: $1,994 x 13 = $25,922. Each month, you’d be writing the landlord or property management company a check for $2,160 in order to make up for the free month. At the end of the lease, the monthly rent would go up. If you can’t negotiate with your landlord and you can’t afford the new rent, you may need to move. Is Net Effective Rent a Scam? This could come across as a real estate gimmick or gotcha strategy as tenants are actually paying for the “free” month throughout the lease term in increments. However, if you’re only looking for an apartment for one lease term, taking advantage of these concessions could be a good way to save a bit of money on an apartment that might have been previously out of price range.